Bed and breakfasts in Northumberland are plentiful but when was the last time you stayed at a hotel in the countryside where you felt it was a little bit of luxury? Somewhere where you can relax in the beautiful Northumberland scenery, whilst having a lavish five-star experience. Our luxury bed and breakfast in Northumberland is not only close to the coast but it is also dog-friendly. If you are looking to try a unique bed and breakfast in Northumberland, then why not visit the William de Percy Inn? This deluxe accommodation offers the opportunity to escape the hustle and bustle of city life. With vast landscape to explore and historical sites to transport you back in time, our bed and breakfast provide the perfect escapism. 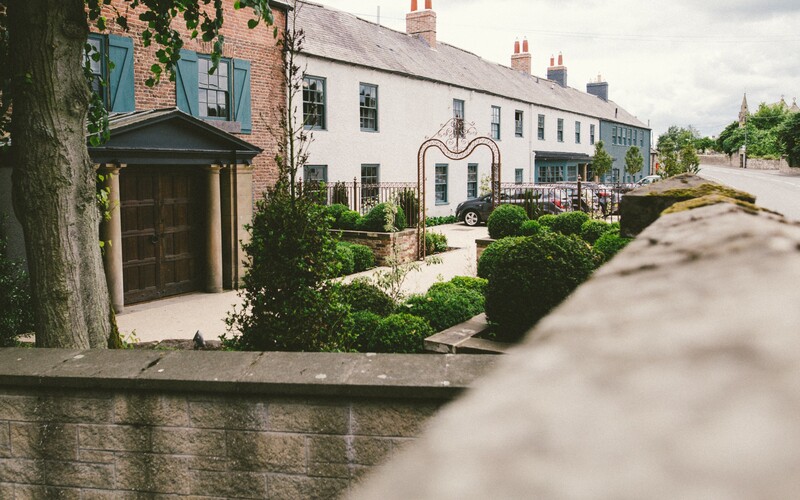 The William De Percy has been fully refurbished and is located in the heart of the Northumberland countryside and is complete with all the latest mod-cons so you don’t feel too far out in the wilderness. Yet far enough to get lost in the countryside! All the latest mod-cons are hidden for those who just want to escape the gadgets for the weekend. The décor in each room is individually designed to try and make each guest stay as special as possible. This uniqueness really stands out and is sure to provide the wow factor. And when you return, you will be pleasantly surprised by the different style of rooms and its distinctive décor. This boutique hotel gives your stay that extra edge in comparison to your usual run of the mill bed & breakfasts. The fancy headboards and lighting will show off the hotels design and give the room a focal point. Our low-slung French beds and soft Egyptian cotton sheets will also provide the utmost comfort during your stay. With free standing baths in every room, a trip to William De Percy Inn really will be one of a kind. Fun fact: There is complimentary Netflix in every room (who else can say that?). So if you just want a relaxing night in, then you can sit back, and relax, in our beautifully designed rooms with full access to Netflix! The William de Percy Inn, bed and breakfast is located in Northumberland where there is lots of beautiful scenery to go and see. If you’re thinking of getting out in the great outdoors then why not take a look at some of these walks you can try in and around the Otterburn area. They range from 0.4 miles to 10 miles and you can take in some local sights along the way, including the Bremenivm Roman fort. As William De Percy is on the doorsteps of the wonderful Northumberland, there is always plenty to do. Or if you are not big on walking, Otterburn has some great places to go fishing. Whatever you are into, Otterburn is sure to take care. So ask one of our staff, and we will be happy to assist. Try something new for your Bed & breakfast Night away! What would a weekend away be without some delicious food? The William de Percy Inn has a great selection of food that ranges from light bites to full-on comfort food and gourmet versions of pub classics. The food on the menu has been sourced locally and includes fish from North Shields and fillet steak from Northumberland. So you only receive the best tasting food! We also have our château next door, based in a stunning setting, with wonderful food and drink to enjoy. Take a look at our wonderful ‘Le Petit châteu’ here. If you’re looking for a bed and breakfast in Northumberland, the William de Percy Inn will not disappoint. We are also one of only a handful of dog-friendly accommodation in Northumberland because we know that you have to take the whole family…including your four-legged friends! So why not book a room at the William de Percy, Bed and breakfast in Northumberland today! It will not disappoint! The service really cannot be faulted here. William De Percy has a 24-hour reception and the staff are always on hand to help you out with any requirements. Whether it be in the hotel or the bar area, our staff are always on hand and happy to help you out. There is also no minimum stay, so whether you want to join us for one night or a fortnight, you are free to stay for as little or as long as you wish, making it the ideal place to stay! Take a look at our review in The Telegraph. We were given 8/10 stars on the telegraph expert rating, showing it’s not just us who think we are excellent in what we do! The decor in our bed and breakfast is not only quirky but has a very luxurious feel. Our style will not be forgotten, with a mixture of traditional and also modern decor throughout the whole bed and breakfast venue. Seahouses is based on the Northumberland coast, it is a large visit – perfect for exploring! The Farne Islands are situated in between Seahouses and Bamburgh, you can get a short boat trip out there – which makes for the perfect family day out in Northumberland. The coast at Seahouses is the perfect place for watersports; surfing is a popular activity. The William de Percy also offers a number of dog-friendly bedrooms to its fluffy little visitors. William De Percy is a dog-friendly B&B, meaning if you’re planning a few day trips with your four-legged friend this summer you don’t can bring your dog to stay overnight too! Northumberland is renowned for dog-friendly venues, with a number of beaches and other attractions. Staying in William De Percy this summer means you can have a mini-break without feeling bad for leaving your dog at home – or trying to find other accommodation for them, which can be costly and time-consuming. Sometimes you just need a refresh from daily life! If you live or work in a busy and hectic city environment, you can end up getting stuck in a rut. Taking a break and going to the countryside of Northumberland for an even just one night, can be all you need to refresh and get the motivation back. Another reason you should stay at this bed and breakfast in Northumberland is to indulge in the best Sunday lunch Northumberland has to offer! Being a pretty bold statement it is worth seeing if it’s true or not, we don’t think you’ll be disappointed. If you’re looking to stay at William De Percy this summer, don’t hesitate to contact us for more information or click here to book a room today!